Cakes for special occasions can be quite expensive.Looking for a cake recipe to make for a special occasion for approximately 40 people? This recipe is perfect for such occasion. you can change the citrus to your preferred flavor. IE Lemon, Lime, Combination. 2 cups of toasted threaded coconut for sides. 1 cup of triple sec liquor. 1.Preheat oven to 160C or 140C if using a fan forced oven. 3.Combine orange zest,butter,chocolate,sugar,vanilla/orange essences and milk in a saucepan over low heat.Stir until smooth and transfer to a large bowl and let cool for 10 minutes. 4.Beat eggs together until smooth and add to mixture and mix well. 5.Add sifted plain flour and self raising flour and stir to combine well and then pour into prepared cake dish. 6.Bake for 2 hours or until a skewer comes out clean. 7.Stand in cake for as long as possible before decoration. 8.To make ganache,place chocolate, orange rind and sour cream in a heatproof bowl over simmering water and gentle stir for 5 minutes until smooth.Remove from heat. 9. Refrigerate for 30 minutes of thick enough to spread over cake. 10. 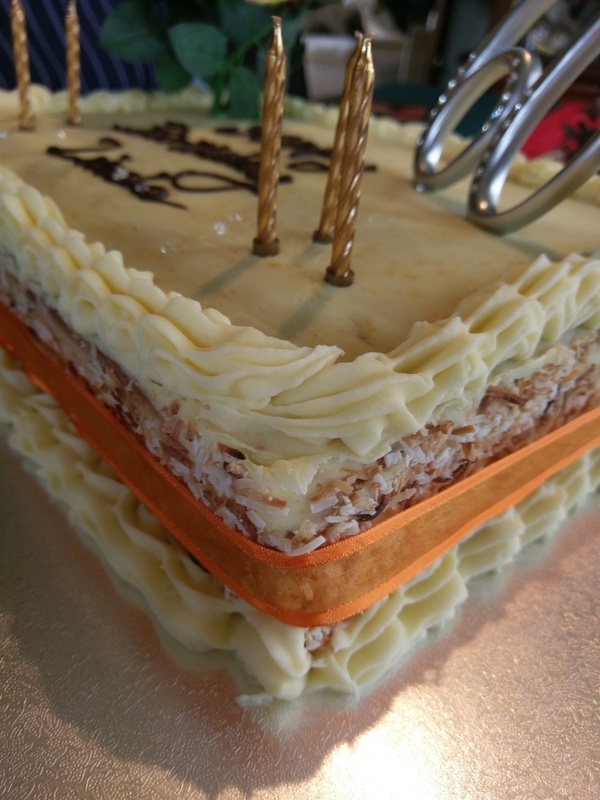 Cut cake length ways carefully into 3 equal slabs,Use a piece of grease-proof paper to slide between layers to remove and reset. 11. Soak cake layers with even liberal splashes of Triple sec liquor to add moisture. 12.Spread ganache to approx 5mm layer, and lay next layer of cake on the ganache and repeat layer of ganache to 5 mm thick. 13. Place top layer of cake of that layer of ganache and spread ganache on top and sides evenly making sure you use a hot palette knife to smooth the top icing nice and smooth with no ripples. 14.Gently push cold toasted threaded coconut into icing on sides making sure there is no gaps.Refrigerate. Will keep for up to 3 days but for best results, serve within 24 hours of decorating. HEAD CHEF, QUEENSCLIFFE HOTEL, KANGAROO ISLAND, S.A.
CASUAL WEEKEND BREAKFAST CHEF,EXCHANGE HOTEL,GAWLER,S.A. TEMPORARY WAITING STAFF, ADELAIDE, SOUTH AUSTRALIA. Cheffing Around Pty Ltd is the original CHEF Employment agency in Australia which is owned and operated by professional Chefs with decades of hospitality experience. Cheffing Around specialize in providing amazing temporary Chefs and all types of professional Chef full-time employment, recruitment and kitchen consultancy to the hospitality sector and we have been providing the highest quality professional Temporary Chef's to restaurants, hotels, cafes, pubs, resorts, mining industries, casinos, private yachts, special events and the general public for over 10 years now. Our Head office is in Adelaide South Australia, but we have opened a new office in Darwin, in the Northern Territory, but we can fly you a Chef to any state in Australia!